In our last Poly-Blog we hi-lited applications in the use of polyurethane as a void-filling material. In this Poly-Blog we will address applications relating to concrete settlement and slab-lifting applications. I would like to at this time thank you for the swimming pool lift and re-align. Albert arrived on time for an estimate and went through all the details of what would be needed to bring a 30 year old swimming pool back to life. Al knew that I was very concerned that one concrete slab had sagged to about an 1″ lower then the next and my grand daughter tripped and fell while running around the pool. Al understood and after going over all of the details to be done an estimate was written and a week later an appointment was arranged. Al and his crew arrived earlier then the appointment that showed a commitment to their trade. Jarrod and Damion immediately went to work on one of the hottest days of this summer. Al kept me informed as each step was taken with details and looking at what was being done. I offered bottled cold water and towels as the job progressed they would only stop to take a drink then back to work. Poly-Mor has proved that the smaller jobs are as important to the client and I am proud to say that Albert, Jarrod and Damion went beyond my expectations of quality of work, professionalism as well as keeping the work area clean. We have peace of mind that the concrete slabs around the pool are level as we enjoy watching the grand children run around the pool. I also look forward to having Poly-Mor come back and work on other areas that we have concerns. I apologize for the length of this e-mail as to express how we feel takes more then a few sentences actually only one word is needed POLY-MOR! VOID-FILLING – Sink Holes, Any Annular Space Fill. Wash Outs, etc. 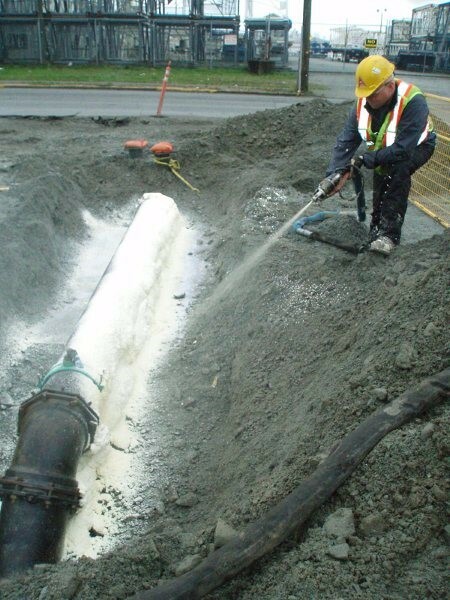 LEAK SEALING – Manholes, Catch Basins, Box Culverts, Storm & Sanitary Lines, etc. In future Poly-Blogs we will get into more detail on each of the products and services Poly-Mor Canada Inc. can offer. 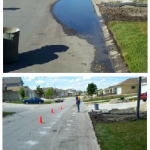 My name is Derek and I arranged for Poly-Mor to lift our driveway. In some areas the driveway had sunk over three inches and several of the slabs were considerably out of alignment. While I was optimistic that our driveway could be fixed to look reasonably well I didn’t think that the final result could meet the expectation of the Poly-Mor sales rep. I was wrong, the driveway looks great and we couldn’t be more pleased. I would like to pass on a special thanks to John of the Concord, Ont. branch for his courteous and caring service as well as all the crew who completed the work. When it comes to slab-lifting, experience counts to minimize cracking in lifting the concrete and having long-term back-up for the work undertaken. Check out the credentials of competitors and compare! My neighbour, a previous URETEK customer, suggested that I contact the URETEK team – ask them to evaluate the CRS work to see if they could make the job complete. 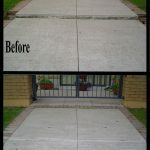 In September 2008, URETEK spent about 3-4 hours only – lifting and leveling my walkway and driveway – removing all kick hazards – and advised me on how to extend the life of the concrete by treating cracks with a special caulking. URETEK did the job, perfectly! All the things CRS could not do, URETEK did without hesitation – they said it was “business as usual”. I would recommend URETEK in a heart beat – unqualified. We could describe in detail how we Void-Fill, Slab-Lift and do Soils Stabilization but a picture is worth a thousand words. The following video pictorially shows how we lift settled concrete structures, fill voided areas and densify weak base soils structures. 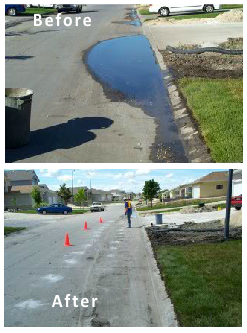 My husband and I are very pleased with the work your crew did here. They are very pleasant and professional. I would recommend them to anyone. Thank you so much for being able to do this work so quickly and to do the extra work at the last minute. As we explained in a previous Poly-Blog, the formulation of polyurethane comprised the mixing of a polyol and an isocyanate that has to be mixed at the downstream end of the process. In the mixing and subsequent expansion of the two mixed components the chemical reaction that takes place produces an exothermic reaction – ie: the reaction itself produces heat or a thermic reaction. The amount of heat produced is approximately 2750 F. It is important to understand this phenomenon as if polyurethane is used around plastics pipes made of polyethylene or polypropylene where the melting temperatures are less than the heat created by the exothermic reaction of the polymer formulation then the possibility that the pipes could melt would be a reality. 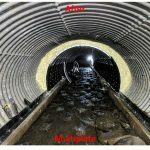 It is noted that those experienced in the use and application of polyurethane systems would not be challenged with a scenario where plastic pipes were involved. R-5.5 – R-6.0 per inch of thickness. I would like to thank you, and your team for a job will done on my concrete pool deck slab lifting at “222 Carson drive, Hamilton, Ontario” . They did an amazing job on my concrete slab lifting. Again, thanks for very good work, and I am sure we will be dealing with your company with lots of work ahead in the near future. 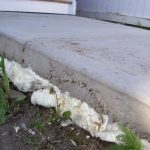 Having briefly covered the fundamentals of polyurethane foam systems we will get into the products Poly-Mor Canada Inc. specializes in and thereafter we will get into the applications under each of Poly-Mor’s unique products. When describing any specific polyurethane system whether it is used for slab-lifting, void-filling, leak-sealing, etc. the system is typically referenced in terms of its density. 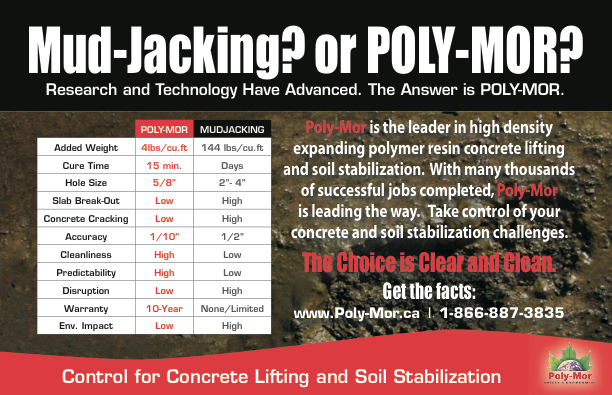 For example, for slab-lifting, the foam system Poly-Mor uses is a 2 ½ lb. expanding polymer density system. What does this mean? The meaning of density is simply that it takes 2 ½ lbs. of liquid material which will expand into 1 cubic foot of solid polyurethane material. Similarly, if you had a 3 lb. polyurethane system it would take 3 lbs. of liquid material to give you 1 cubic foot of solid material. It is noted that in order to maximize the closed cell content of any foam system it must have a minimum density of 2 lbs. or more. The low density foams typically used for insulation purposes is well below the 2 lb. 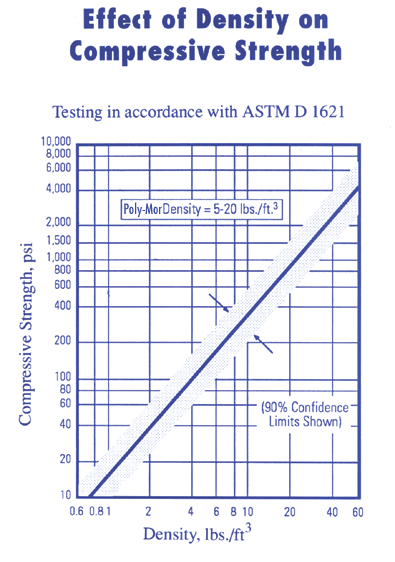 density requirement for closed cell material. The polyurethane foam you can purchase at a hardware store is very low density and hence open celled material which will nor stand up to exterior environmental conditions, especially freeze/thaw cycling. I would like to take this opportunity to express my thanks and pleasure with the slab treatment Poly-Mor recently completed at my home. I want to express what a pleasure it has been to deal with Uretek. Right from the first contact with Harry, through dealing with the crew at my home, to receiving the bill. You should be proud and comforted to know that such a top-notch bunch of guys represent your company. Next time we will briefly review other characteristics of polyurethane foam like exothermic reaction, R-Value, etc. Over the next number of months, together we will be reviewing the basis of our technology, the products offered by Poly-Mor Canada Inc. in meeting challenges related to slab-lifting, soils stabilization, leak sealing and other applications, as well as advantages of our technology over other technologies like mud jacking, pressure grouting etc. Everything Poly-Mor does and every product application is based upon the use of a specific expanding polymer system. Depending upon the product application, engineering specification, desired results, etc. an expanding polymer resin system will be employed. In more simplified terms the expanding polymer resin systems are different polyurethane (PU) systems. Polyurethane is a two part chemical system where a Polyol and an Isocyanate are mixed at the end of a specialized injection gun. The Polyol and Isocyanate start to gel within seconds and expand up to 20 times their liquid volume. The below video demonstrates this process. I would like to thank you and your team for a job will done on my concrete pool deck slab lifting her in Hamilton, Ontario” , they did an amazing job on my concrete slab lifting. I only hired them to do one part of my concrete slab fixing but I will be doing the rest to complete the fixing of all slabs around my house in near future. I also, will be recommending your company to all our offices of Stantec Consulting for any future jobs requires your expertise. This solution of concrete fixing for slabs and foundation will be a great money saving to lots of our clients and adding to this type of product used as environmentally friendly product and very efficient way of permanent solution. Again, thanks for very good work, and I am sure we will be dealing with your company with lots of work ahead in the near future. We will address certain terminology relating to polyurethanes such as density, exothermicity, R-Value, etc. Poly-Mor Canada was inaugurated in 1998 as an alternative technology to mud-jacking. Initially incorporated as Foam-Tek Canada Inc, and shortly thereafter the name was changed to Poly-Mor Canada Inc. In 2008 we rebranded ourselves as Poly-Mor Canada Inc. We are proud to note that we were the first company in Canada to use expanding polymer resins systems to lift and stabilize sunken concrete structures. Our Company’s objective is simple. POLY-MOR will provide quality concrete slab-jacking, stabilization, leak sealing and restoration services to customers at fair prices. 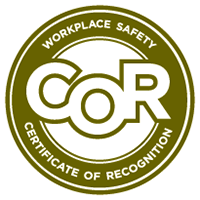 The price of our services will reflect work safety, quality materials, efficient work, and profit margins that provide long-term company growth and stability. Since or inception in 1998 we have expanding our slab-jacking technology to a point where we are now a national company with offices from Vancouver to Halifax. During this period of time we have undertaken literally thousands of slab-jacking jobs from the smallest or residential jobs to slab-lifting of bridge approaches and concrete paved roads. Stay tuned! Our weekly Poly-Blog will be communicated starting next week on what our focus will be over the next number of months.